With thousands of people taking to the streets of London to block high-profile locations across the capital, Extinction Rebellion activists have escalated the campaign to tell the truth. Around 9 Extinction Rebellion activists decided to take Shell and its criminally negligent CEOs to task over their part in the ecocide we are witnessing around the world. At least one arrest has been made. Multiple activists glued themselves on to the windows and blocked the doors in support of Stop the Ecocide campaign. Activists smashed the glass of the revolving doors, with others climbing the scaffolding of the building and have put up a banner that says ‘Shell Knows’. 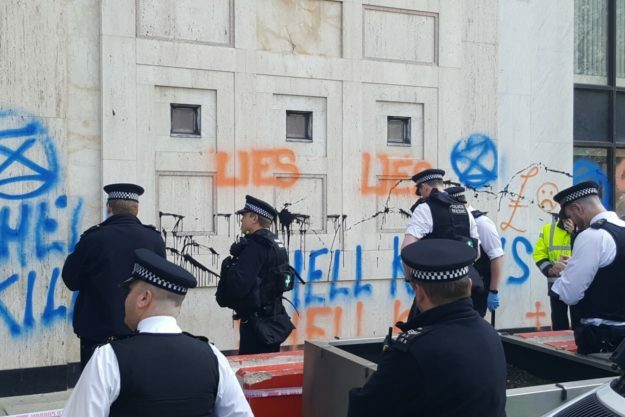 Activists have also spray painted the wall with the word ‘Lies’ and there are people with banners that say ‘Fossil fuels are killing us – zero carbon now’, plus placards with Shell logos corrected to tell the truth. By intentionally causing more than £6,000 worth of damage, the activists aim to get the case into the Crown Court to put their case to a jury of fellow citizens rather than in a Magistrate’s court where judges sit alone. For decades, Shell has known of the effects of C02 pollution and its role in the current ecological catastrophe. Yet it has done nothing but cover up and deny the truth about fossil fuels and their effects on our atmosphere. It has spent millions of pounds lobbying against action that could have prevented this unfolding tragedy and has actively undermined renewable targets that could steer us away from the worst effects of ecological breakdown. The activists stated: “The ongoing ecocide the world is witnessing is a crime against humanity and nature that threatens the very future of life on this world – and still our governments remain silent about the severity of the threat and still the industries that drive this collapse are free to pollute and to steal the future from our children with zero accountability. “Climate negotiations have failed to prevent the escalating harm. You can’t negotiate with hurricanes, or melting ice caps. A criminal law against ecocide would impose a legal duty on governments to protect the planet’s biosphere. Realistically, it’s the only reliable way to force industry and society to change direction. “How can we not act? It’s clear as day that we need to protect our communities, our rapidly vanishing nature and its just as clear that companies like Shell are responsible. They must be held accountable. We are trying to prevent crimes against humanity through our actions. Why is Extinction Rebellion engaging in criminal activity? Extinction Rebellion engages in peaceful, nonviolent, civil disobedience to draw attention to the most pressing issue of our time. Extinction Rebellion’s strategy is to tell the truth on the climate and ecological emergency. Intentional arrests for criminal damage allow Extinction Rebellion to take this core strategy into the courts. Telling the truth is the basis of our legal system. When witnesses take the stand they promise to “tell the truth, the whole truth and nothing but the truth”. Extinction Rebellion takes that oath extremely seriously. Trials that result from acts of criminal damage provide an opportunity to tell the courts that without an urgent and radical change of course, the consequences for humanity and life on earth are likely to be catastrophic. The analogy is obvious. Our house is on fire. The emergency services have broken down. Urgent action is required to prevent the spread of the flames. Extinction Rebellion supports the campaign Stop Ecocide: change the law which supports the amendment of international law to include a crime of ecocide. More information at https://www.stopecocide.earth/. The Crown Prosecution Services gives Lawful Excuse to those who “intended to use or cause or permit the use of something to destroy or damage it, in order to protect property belonging to himself or another or a right or interest in property which was or which he believed to be vested in himself or another”. Check out the International XR website, with links to the French, German, Italian and UK websites. We are holding Collaborative Leadership Calls to help coach people to improve their leadership skills and capacities.